A Starfinder Society Scenario designed for levels 5–8. After much negotiating, the Starfinder Society has reached an accord to work with leaders of the Drakelands and Skyfire Mandate on the world of Triaxus. To commemorate this historic achievement, the Society intends to open a new lodge in the settlement of Cumo. However, a recent enemy intends to disrupt the event, and only the PCs stand between this hidden threat and the Society's newest endeavor. 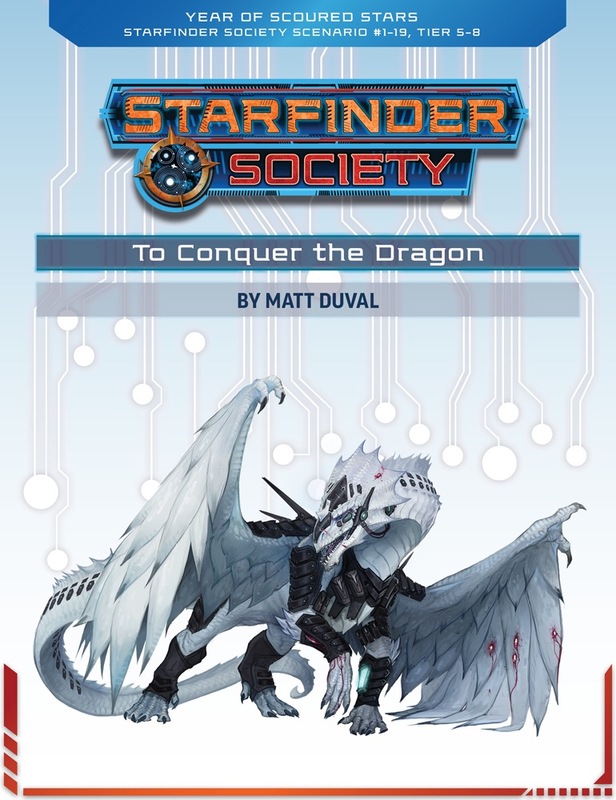 Content in To Conquer the Dragon builds on story elements established in Starfinder Society #1–13: On the Trail of History, however, playing that previous scenario is not required. To Conquer the Dragon sends your players to Triaxus for the grand opening of the White Sands Starfinder Lodge. This new lodge is located between the Drakelands and the Allied Territories, and its opening is a huge win for the Society! Your job is to get there, ensure the gala goes off without a hitch, and impress the many dignitaries that will be in attendance. Sound a little familiar? Yeah, it’s premise is a bit like #1-05: The First Mandate, which worried me a bit. You attend a gala and try to impress some guests. It gets violent. That said, this scenario is full of surprises, and didn’t go as I expected. You get to spend a lot of effort on patrolling and defending the gala, which can allow you to do some pretty helpful pre-emptive things which affect this adventure’s outcome and how the Starfinder Society is perceived on Triaxus. The attack is certainly different than I expected it to be, and the sections of the adventure that follows are unique. The starship battle is a bit tricky and can really benefit from an awesome science officer, which is great to see. There’s a lot of fun social encounters, but honestly, where I think this scenario can most shine is its villain. She’s unique, driven, and has a grudge out for anyone whose played #1-13. This is personal, and she ensures your players know it. Of all the enemies I’ve seen so far in the Starfinder Society, she is BY FAR my favourite, and the most memorable. I highly recommend GMs play up this fierce opponent as much as possible! All in all, I think this is a great (but very dense) scenario, that suffers a bit from its similarity to The First Mandate. That said, it’s considerably different, and makes excellent use of its side characters and main villain. Not my favourite, but fun. A very thematic scenario. Who wouldnt be exited to go to a planet full of dragons, to work with a dragon VC?!?!?!?! The only issue I have with the scenario is that if you fail some skill checks, the transitions between some scenes can be a bit weird, but nothing a GM cant work with. The fights can be pretty tough and the take on the starship combat is very cool! 5/5 would get eaten by a dragon again. Good mostly through, but gatekeeping at start marrs it. This scenario is fun, but there are a few gatekeeping situations that really hurt it. At the start there is a bit that basically requires the physical science skill, and if the party doesn’t have the skill (or the people that do roll super low, like in our group,) the game just stalls. Not really that fun. The middle part of the scenario is great though, with some good intrigue, and a real climax that is mitigated based on how well skill checks were made. And the skill checks are varied enough that most parties will be able to get at least some of them. There is an ending fight that is pretty tough because the environment gives the bad guy a huge advantage, but it is also climactic and fun. There is a bit of an issue in that the scenario expects you to fight, then get the mcguffin, but you can get the mcguffin during the fight. All in all, solid scenario with some real fun bits, marred by the stupid bit of gatekeeping at the start. There's a lot to like about To Conquer the Dragon. It has one of the most cinematic set-piece encounters published in the series so far, some interesting NPCs, and some links to scenarios past (and presumably) future. PCs with a wide-range of skills will be able to contribute in various ways. Overall, it's a solid package with my only real criticism being that it should be more challenging given the tier it's designed for. Naiaj, the bleachling gnome Venture-Captain, starts this scenario by briefing the PCs on their mission: they're to attend a gala marking the opening of a new Starfinder Society lodge in Cumo, a trade port on Triaxus. The bad luck that Starfinders traditionally have at galas (see "The First Mandate" and "Save the Renkrodas") is referenced by Naiaj, which is something I appreciate--it's good for writers to be self-aware of the tropes they use! I also like the little ways that Naiaj has been given a memorable personality (she's very matter-of-fact and always busy with her datapad, but also secretly arranges extra resources for the group out of her own funds). This is the first Starfinder Society scenario to take place on Triaxus, one of the major Pact Worlds, and it'll be a good opportunity to show off some of what makes that world unique (e.g., its population of dragons!). When the PCs reach Triaxus and the new lodge, they're greeted by a bronze dragon named Zafeldrin who is the lodge's new Venture-Captain. Preparations for the gala are underway, and, after introductions, Zalfeldrin subtly tests the PCs through some riddles and problem-solving tasks. It turns out that Naiaj and Zalfeldrin often test each other's agents in this way, and it's a fun opportunity for a little role-playing and some skill checks. The new lodge is well-described, and I like how the flip-mat was used to provide visual cues even though it's not actually necessary for an encounter. For the gala itself, the PCs are asked to both provide security and impress several local dignitaries who will be attending. In mechanical terms, this proceeds in a fixed number of rounds; each player is asked each round to declare who they want to talk to (if impressing guests) or how they want to perform security (such as patrolling the grounds, monitoring buildings, etc.). The guests to be influenced are only given capsule descriptions and not much in the way of personality cues, so this part of the scenario is going to succeed or fail based on how good the GM is at role-playing improv. I did really like the array of skills that can be used to influence different guests, and that the DCs are lower for the Profession skills (since a PC is less likely to have the particular one necessary than a generic skill like Diplomacy). I found it harder to integrate the security actions (and associated skill checks) in a seamless way, even though I understand that we don't want Perception to be the uber skill. Assuming the PCs do a reasonable job with security, they'll find that some navigation beacons have been smuggled in and planted around the new lodge. The beacons are transmitting precise coordinates so that a starship can launch an orbital bombardment! In mechanical terms, the PCs suffer more damage from the bombardment for each beacon they've failed to find. It's a cool idea (the first time I've seen the like in a Starfinder scenario), though I wish it were fleshed out a little more since it's such a cinematic event. Zafeldrin asks the PCs to take their vessel and confront the attacking starship, which has not only attacked but also hacked into the lodge's computers and downloaded information on secret operations and agents. This leads to the requisite starship combat. The gimmick for this one is that several civilian freighters have been commandeered by the enemy vessel through remote control (?) and some have been armed with missile launchers. So during the battle, the PCs may suffer surprise attacks unless they figure out which of the freighters are armed. It's actually pretty easy to make this discovery, however, and there doesn't seem to be any Infamy or other consequences for the PCs to attack one of the freighters, so I have to chalk this up as an interesting idea that's poorly executed. In the scenario I ran, the four-player adjustment meant that only one of the eight freighters was armed, so it didn't make that much of a difference in the space combat. The PCs won pretty handily, and my general trend of complaints about space combat continues: it's rarely dramatic or exciting. And in this one, if the PCs somehow do lose the space combat, there's a deus ex machina (Triaxus ex machina?) as good-aligned Triaxian starships intervene to save the day. All the PCs lose if they lose this battle is a point of Reputation. I think at this level, it's okay to have real consequences! Let the PCs die if their ship is destroyed, or at least say they have to use escape pods to survive but that the scenario is over and they lose. High-level players shouldn't expect coddling. So one way or another, the enemy ship will be forced to crash in the snowy Parapet Mountains near Cumo. 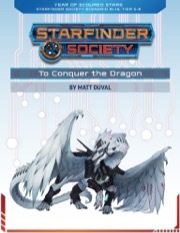 The PCs will, by this point, have learned that their antagonist is an old white dragon named Norys who wants vengeance on the Starfinder Society for their role in disrupting the Frozen Trove corporation's activities on the planet of the Izalguun (# 1-13: "On the Trail of History"). When the PCs land near the crash site in order to recover the stolen data, there's a harsh snowstorm in the area (though most of the encounters take place inside, so it doesn't matter too much). The enemy ship has broken into a couple of pieces. Inside the largest piece, the PCs have to deal with a couple of hazards and put down some mercenaries. The cumulative effect is to soften them up a bit before the big final battle of the scenario: a very cool encounter against the white dragon in the bridge of the starship, which is literally dangling over the side of the mountain (held precariously in place by twisted girders and cables). Norys has superior mobility here and can hide well (thanks to some tech and levels in Operative), so the PCs are likely at a disadvantage. Some people in the forums have complained that this is a TPK encounter, but I don't really see it. The dragon's breath weapon doesn't really do that much damage at this level compared to what the PCs can pump out if they simply ready actions to attack when Norys appears. When I ran the encounter, three of the four PCs were Iconics; and although it was a reasonably long and exciting encounter, I didn't really get close to killing anyone (especially since Starfinder characters are super hardy with all the Resolve Points they get). As one can expect, once Norys is defeated, the PCs can recover the stolen data and accomplish their primary success condition. I've made a lot of criticisms here and there, but overall To Conquer the Dragon is a solid, fun scenario. It offers a good mix of role-playing and combat, has some memorable combat encounters, and contributes to the growing world-lore (with the new lodge established in Cumo). I'd certainly like to see Zafeldrin again, and discover if Frozen Trove's grudge against the Society will continue or has died with Norys. Since I haven't seen it yet, here are the maps used. I admire that the dragon from the cover of the Playtest has decided to upgrade because he's sick of Valeros beating on him. Where's your God(s) now, beatstick machine? Does anybody know if there is a boon to unlock Dragonkin as a playable race in Starfinder Society?